Enabled by the rotating camera, people can experience an uninhibited view with Samsung’s first New Infinity Display. The Galaxy A80’s 3D Depth camera offers Live Focus videos by scanning objects for measurement and depth. 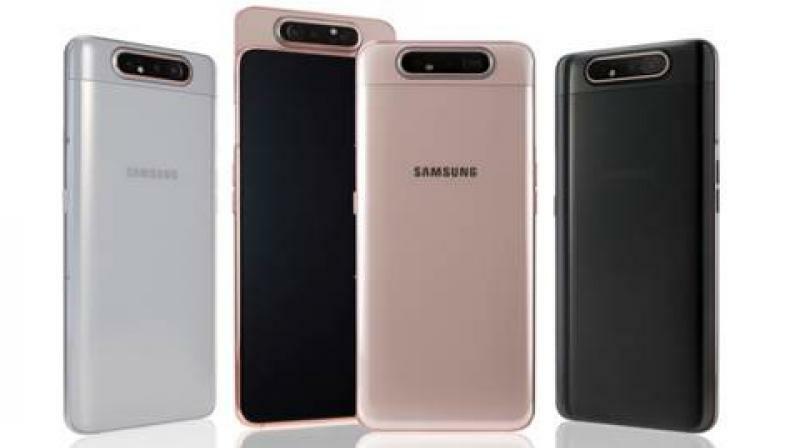 Last year, Samsung had announced that they would be throwing their entire cutting-edge tech on their mid-range handsets and in typical fashion, the Galaxy A80 has been announced with a unique pop-up flip camera. Created with Samsung’s first rotating camera, the Galaxy A80 lets people seamlessly capture the world around them. When users select the selfie mode in the camera app, the three cameras automatically pop-up from the back of the phone and rotate. The innovative camera mechanism delivers the same extraordinary triple camera experience with the same high-resolution lens, front and rear, so you never have to sacrifice on quality. With the 48MP main camera, users can now shoot vivid images day and night. The Galaxy A80’s 3D Depth camera offers Live Focus videos by scanning objects for measurement and depth. Built with an Ultra Wide angle lens with the same viewing angle as the human eye, so your favourite views can be shared with less panning. Bixby Routines helps keep you on track by learning your app usage patterns and analyzing your habits so that it knows which features you need when you need them. Bixby Routines automates your everyday tasks and apps based on your routine, such as driving or being at work. Fortified by Samsung Knox, Samsung’s defence-grade security platform designed to protect from chipset to software, people can enjoy the freedom of connection safely on Galaxy A80. This allows people to use Samsung Pass to access apps and websites by using biometric authentication. To increase ease-of-use, a fingerprint scanner was embedded on-screen so people can intuitively unlock their phone. To complement people’s active lifestyles, Galaxy A80 includes button-activated or hands-free Bixby so that users can get connected to the information needed more conveniently. Users can also easily access other features such as Bixby Vision, Bixby Home, and Reminder while on-the-go. The Galaxy A80 also features key Galaxy experiences including Samsung Health, Samsung Pay and more. The Galaxy A80 is available in three colours: Angel Gold, Ghost White and Phantom Black. The Angel Gold colour includes elements of pink, while the Ghost White option combines some blue characteristics, so these colours look different depending on light direction and reflection.